First step should be to decide what kind of pond do you want. Now is the time for some research. Check out some photos of ponds and pick a design that appeals to you, and will look good in your backyard. Look for a pond contractor who posts project photos. New Jersey pond designer Mike Gannon, has a portfolio of water garden and koi pond projects on Pinterest if you need some inspiration. Once you are inspired, decide where to locate your pond. In your New Jersey backyard be sure to keep the pond close to your outdoor living area; don’t make the mistake of placing your pond too far away. Koi ponds and water gardens are best enjoyed in proximity to a patio, deck, or seating area. Next decide whether you will buld the pond yourself or hire a pond contractor to professionally install your koi pond or water garden. 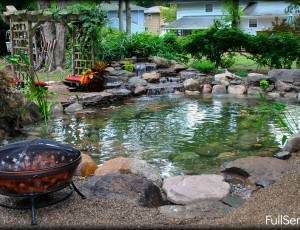 If you choose a DIY pond project check out some koi pond and water garden “how-to” videos. 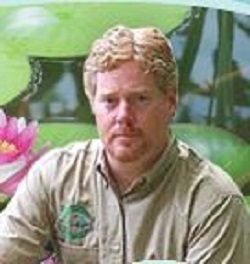 Youtube has many excellent videos from professional pond installers that show you how to build a pond. If you decide to hire a pond professional they are easy to find on Google; just search for “pond installer New Jersey” and you’ll see your local pond professional show up. Then layout the pond. The bigger the better, don’t go too small; many pond fish grow pretty large and so do aquatic plants in your water garden. Make sure the pond is dug at least 24″ deep. New Jersey winters can be pretty tough and a water depth of 24″ or deeper is safe to keep your fish outdoors during the winter months too. Try to use professional grade koi pond water garden equipment to build your pond. EPDM pond liner is great for New Jersey ponds and will keep them water tight. A pond skimming filter and biological filter will work together to keep your pond water clean and clear. Using a submersible pond pump for your pond will keep your pumping system out of sight, and quiet! After your pond is constructed you can consider adding some bells and whistles to your pond. How about a fish cave so your fish can hide from predators? How about adding some pond lighting for extended viewing hours and dramatic nighttime displays? Or, add a personal touch with a fountain or spitter for your pond. Adding aquatic plants to your pond will not just beautify your water garden koi pond, it will help keep your water healthy by consuming organic nutrients. Adding pond fish is lots of fun, and you can choose from many varieties of goldfish or koi for colorful fish in your pond. Once you’ve added fish and your new pond installation is complete, learn how to feed your fish to keep them happy and healthy. By following these easy tips and suggestions you are on the way to having an amazing backyard koi pond and water garden. Now you can plan your first pond party and share you new aquatic obsession with your family and friends. There is always something new to learn in pond keeping so use your resources like koi pond and water garden blogs, facebook pages, and pond industry experts who can teach you. And be sure to make friends with your local pond professional to help you along as you discover the amazing dynamics of your New Jersey water garden koi pond. Enjoy, and keep it pondy!